For the first time you are printing, particularly on pre-cut icing sheets, it is important to ensure that the settings are correct in order to line up the design properly. Open pdf from Adobe Reader, and click on the print button (if you don't have Adobe Reader you can install it here). See yellow note below for why we recommend Adobe Reader. Check the following settings and then just press print! 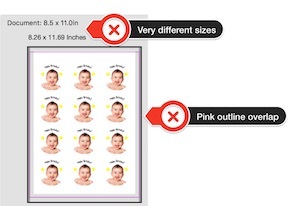 Tick 'Choose paper source by PDF page size' (to ensure the document and paper size match). Can't see this tickbox? Just go into 'properties' and choose the relevant printer paper size you are using. If there is an arrow on the sheet, make sure this end is feeding through the printer first. Otherwise if just a clear tab, point this end in first. 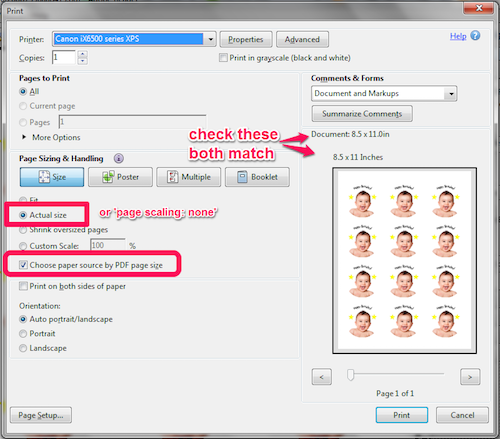 You can double check if the printer will be using the right scaling by checking the two values match on the RHS. If you're using A4 paper, both values should be 8.26 x 11.69 inches (or Adobe may round up one set of values to 8.3 x 11.7 inches). 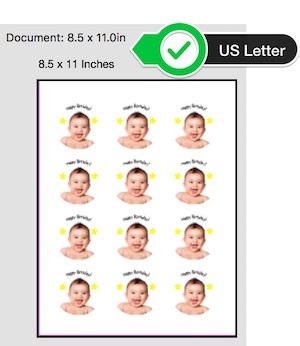 If you're using US letter, both values should match 8.5 x 11 inches. NOTE: Why use Adobe Reader to print? We generally advise to use Adobe Reader to print your designs, since they provide options to ensure that your printout isn't resized when printing. 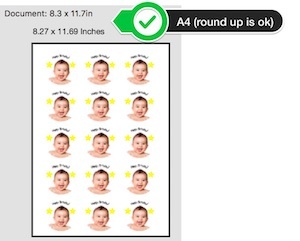 When printing from Chrome, another browser, or Mac preview, these can sometime resize, losing accuracy against the pre-cut toppers.